For many homeowners, the refrigerator is the first big purchase for their kitchens. 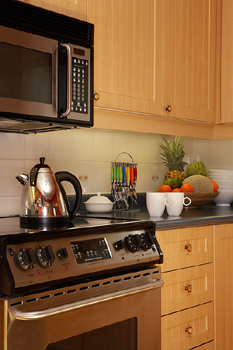 It’s one of the most important appliances in a kitchen, and today, this basic necessity is loaded with options. If it’s come time for you to make this big purchase, make sure you have all the information you need so you can make the best choice for you. 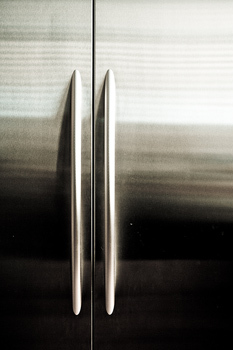 Did you know, for example, that a refrigerator can last more than 15 years? It’s true. So the fridge you want now needs to be the fridge that can accommodate your needs then. 1. Kitchen Size: Probably the most helpful determining factor is size, and it narrows down the appliances you should consider. 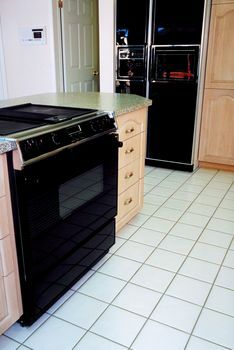 How much space do you have in your kitchen—is there a set cut-out for the fridge or do you have a little flexibility? Think not just about height, width and depth of your fridge; measure its size when opened and picture that in your space. Will you be able to get things out easily? 2. Personal Needs: After you know what you can fit in your kitchen, think about how much space you need for storage. Two people will usually need between 8 and 10 cubic feet of space, and you’d want to add an extra cubic foot for each additional person in the household. When in doubt, buy the bigger size: it’s much easier to have too much space than too little, which will force you to waste time squeezing groceries inside. If it will be hard to fit the right size fridge in your kitchen, you could also consider an extra refrigerator or cooler for the garage or basement. 3. Types of Models: Today’s refrigerators are all about options: side-by-side, top-bottom, different colors, ice/water dispensers. Often, the fridge will have adjustable shelves to accommodate a variety of food sizes. Ultimately, which of these things you should choose is completely dependent on you. Take the time to determine what you want and what works best in your space. a. Spill-proof Shelving: Designed to minimize leakage through the fridge. b. In-door drink sections: Smaller, mid-level compartments that hold beverages or other items. 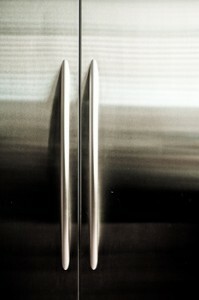 Big plus: this saves energy by not requiring you to open the whole refrigerator. c. Storage bins and crispers: With compartmentalized temperature controls, these sections allow you to keep produce fresh. d. Bottom freezers: Putting the freezer sections into pullout drawers and the bottom allows the refrigerator section to be side-by-side at eye level. e. Deli/meat keepers, butter keepers: Compartments designed to aid organization. 5. Energy Efficiency: If you’re interested in going green with your appliances, look for a refrigerator with the ENERGY STAR® label. Not only is this a more eco-friendly option, but it also can provide great savings to you, by reducing the cost of operating the machine.